Of late our eye has been fixed upon the Chumash Wilderness and its environs — Mt. Pinos, Apache and Quatal Canyons, the San Emigdio Mesa. The lands where I cut my backpacking teeth, learned to shoot, and spent many a winter camp with the Boy Scouts. The area east of the Cuyama once held numerous car camps; now but a handful remain. Back in the day there were Blue Rock Spring, Mud Springs, Yellowjacket (no, the other one), Dome Spring, Nettle Spring, Cienega (“Marshy Spring”), Mesa Spring, and Toad Spring. See how those remaining are treated (as we did this past weekend), and it won’t be any surprise when the rest are shuttered. Still there; drive up the dusty road along Dry Canyon and you can still enjoy its limited offerings (though be mindful of the UXO left by Army artillery exercises during WWII). Still there; a 10-mile drive along the graded dirt road leading east along Apache Canyon. Mucky this time of year, but just off where Quatal Canyon Road splits past Pine Mountain Club. 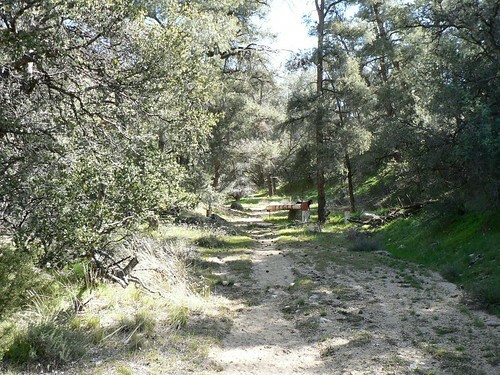 When the Chumash Wilderness was formed in 1992, this 4WD site became a trail camp. It receives few visitors now along the south flanks of Cerro Noroeste (Mt Abel), but with its table and the old wooden water tank still makes for a fine destination, especially for those heading deeper into the Cuyama badlands. Well now wait a second, didn’t we already cover this? Well, yes … but no. As idly mused a while back, the Los Padres — like anywhere else — has its share of duplicate placenames. 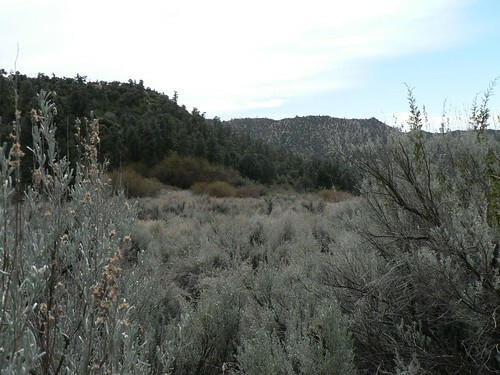 And like Yellowjacket (no, the other one) mentioned above, the Cienega some know and love behind Santa Paula Peak isn’t the only site to carry the name. Or at least it didn’t used to be. 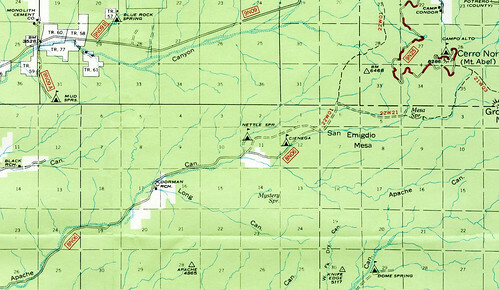 The late 60s and early 70s Los Padres recreation maps show another drive-in camp along Apache Canyon just beyond Nettle Springs called Cienega. In 2001, some of the crew enjoyed a trip that has since gone done in our lore as “Apache Monster,” a not-overly ambitious trek that took us from Lockwood Valley to Sheep Camp, over Grouse Mountain and then down onto the Mesa and down into Apache Canyon, then followed Apache Canyon to the saddle just upstream from Lily Meadows and back out. (Got that?). 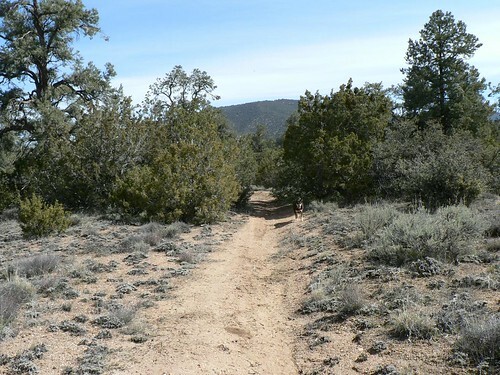 On that trip, ZK, JP-san, and I took one of the older routes from Mesa Spring southwest toward Apache Canyon, one that some of the maps referred to as Cienega Trail. 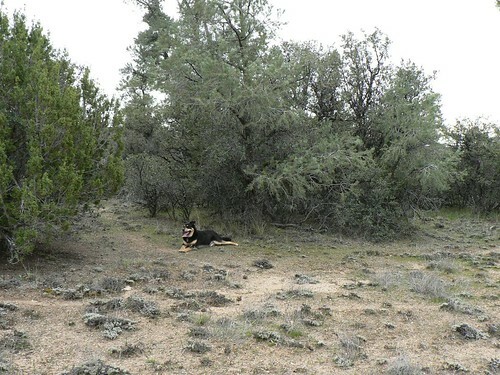 As we neared Apache Canyon, we entered a (relatively) clear and fairly pleasant area that had been fenced off and which we presumed to be a private inholding. Rain had been an intermittent visitor most of that day, and as angry-looking clouds continued to form to the west, we’d not spent much time picking around. Only recently — in a sleep-deprived, single malt-fueled moment of clarity in the dungeons of maptitude — did that old flat and old map make clear to me we’d walked through a camp unknown. The weather was fine; with the exception of perhaps this past November, we really have been lucky on every day/weekend/6-day trek we’ve undertaken of late. Some high clouds and a touch of breeze that — as we followed the abandoned road eastward from Nettle Spring toward the mesa — made the day feel like a sojourn through the Wasatch. The trail up is clearly receiving no maintenance, but here’s the thing: out here in the “badlands,” it doesn’t matter. Whereas in the Ojai front (and back) country and the Santa Barbara district a re-route entails having to push through hard chaparral (manzanita, chamise, whitethorn ceanothus and a host of other impassive bloodletting flora), here you simply have widely-spaced pinon, soft sages, and … well, that’s about it, actually. One just simply walks around a fallen tree. There’s room to move out here — lots of room. Even the soil seems more forgiving in this swathe of geology: largely decomposed granite, so while not loose enough to belabor one’s quads, neither does it jolt the teeth from one’s skull. Lovely stuff. We made good time to the mesa, making note of the old roads that cut in and out of the main track, and compared the GPS data with which our Garmins were loaded — like with the 1995 series of 7.5′ quads, there’s so much “historical” stuff plotted, a brother could get lost for months just trying to find some of the things that are supposedly out there. 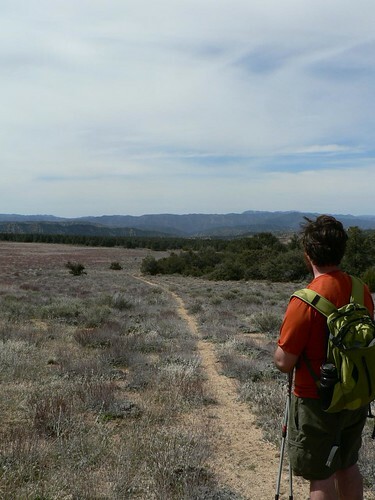 We climbed the increasing grade of the main meadow to the Toad Spring/Mesa Spring trails’ junction, our views of Cuyama and Madulce Peaks improving as we did so. There was one point at which the two lined up in our view, and quite easily one could imagine either the Beacons of the North being lit in Gondor’s aid, or — more practically — the efficacy of the old fire lookouts. West Big Pine to Madulce, Madulce down to Cuyama, Cuyama over to Pinos, and Pinos … well, what couldn’t be seen from that old lookout? Very little, I imagine. From the junction, we retraced our steps, every so often studying the contours and wondering just where exactly one might most easily access the canyon (let’s called it Cienega Canyon) where this erstwhile diamond in the rough lay in its sage- and pinon-dotted repose, long bereft of camper company. As we left the grasses of the mesa and began to follow the narrower canyons down the tributary along which the eastern-most piece of the remaining trail runs, we spotted a game trail at what we reckoned was just about the right elevation to traverse the divide to our south and see what might be out there. We checked the time — we’d intended on a fairly short day, as my lovely bride was fixing corned beef and cabbage for an early St Patrick’s Day meal. I checked the maps. Hmmm. I checked with ZK. Hmmm. Checked the watch again. Oh, the agony: a lost campsite, or that corned beef and cabbage? Maybe for some the decision is easier than for me. Praying my beloved would save us a plate, we scrambled up the game trail and cut south across land as untouched as any I’d seen in months (maybe years). And still the going was easy. Duck a juniper here, walked around a pinon here. I know I said we’d break a sweat after our ridiculously lax weekend atop Pinos, but you can’t make the trail make it harder than it is. Sometimes it just isn’t hard! We reached the edge of the Cienega Canyon drainage, and here things became a tad sketchier. We spaced ourselves out a bit and scrambled down the loose yucca- and juniper-dotted scree, and landed quite nearly on top of an old pile of pull-top steel beer cans riddled with bullet holes. 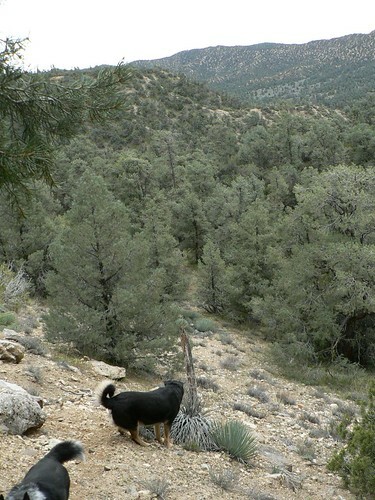 We were standing now atop the old targets of shooters of generations past, and the GPS receivers showed us standing on a trail (yeah, tell that to the mutts who spent much of their descent deftly dodging the yucca). As the clouds darkened and the air cooled noticeably, we came to a wide grassy flat out in the drainage that we’d marked Cienega. But it was surrounded by barbed wire. Hmph. And, I was finally forced to relent, there was nothing really left here. Some sites — Timber Canyon, the original Ortega, Topatopa Lodge, even Sweetwater — any of the sites, really, that have been given up over the years usually have something going for them. If not the actual locale, one can often spy a near-mint ice can stove or something of interest. 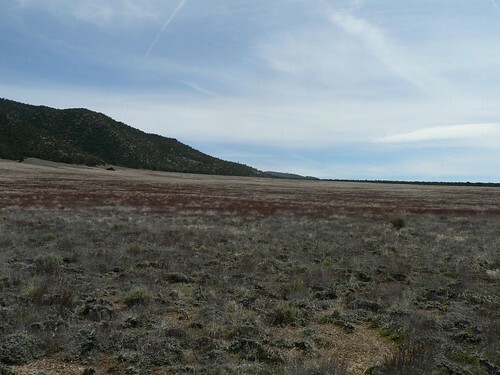 And while the entire San Emigdio Mesa and Apache drainage is fascinating for both its wicked geology and flora, this old site didn’t seem to yield anything novel. It was, I am loathe to concede, a minor disappointment. ZK and I led the mutts back up the slope, and we followed an approximation of our first route in back to the trail, and headed down to Nettle Spring. I took consolation that in the end it still proved a great day. We effectively “connected the dots” on a trip done long ago and a few we’ve got planned for the coming season; ZK got to see a stretch of the forest in which he’s spent little time, and I learned a valuable lesson which I know will see me through any such minor disappointment: there’s always corned beef and cabbage. Great write-up Craig. It looks really beautiful out there… a place I still need to visit one of these days. One of the unique and compelling features of this blog is that one can read it casually and enjoy the writing or dive in with some commitment, given the depth of research in these vignettes. 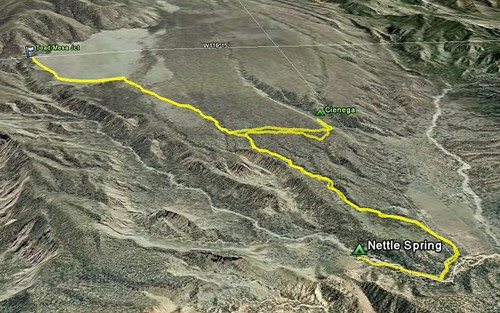 I had to review some of my old maps and notes to ever remember Apache Canyon / Nettle Spring. I have no recollection of this Cienega (as opposed to the other one), likely because I never knew it existed. I now remember a trip to Nettle Spring around 1970 in a vintage Wyllis CJ-3A. I also remember that the rear end in the Wyllis could be used in a Henry J hot rod. Not many blogs will elicit that degree of free association. Thanks gents. I forgot to mention in the write-up I found a nearly-new 8-in Craftsman crescent wrench on this trip. Always handy! Chalk up another one for the “Lost and Found” entry. Sweeeeeet. I was out at Apache Cyn. recently. Love that country out there! The color play off each other of the red soil, green pines and blue sky is exceptional in the late afternoon light of winter and early spring. Anyhow, hope Nettle Springs Campground stays open for years to come. Hiking trails are a bit overgrown by vegetation due to low density hiking.